Acorn is an image editor for macOS 10.11 and later, including macOS 10.14 Mojave. One of a kind, no subscriptions, no hassle. Use non-destructive curves, levels, and filters. The GPU power of Metal 2. Add layer masks and selections to touch up your images or make something entirely new. Remove backgrounds, combine images, perform color correction, resize, transform, crop, and much much more. Acorn 6 includes a new Path Text Tool, so you can wrap and warp text anywhere you'd like. Just create a shape or path, and add your text! And since Acorn's text is always Unicode aware, you can even have Emoji on a path. Combine filters together to create endless combinations of unique effects knowing you can always change your mind later on. Customize your own presets and use the on-canvas controls to place your filters exactly where you need them. Quickly and easily place your text on a circle to create logos and other useful text designs. Modify your text with on-canvas controls for circle radius, rotation, and inversion. Use the baseline and kerning sliders to fine tune your text. Tilt shift, vignette, drop shadow, gradients, sharpening, color correction, distortions, blurs and over a hundred more. 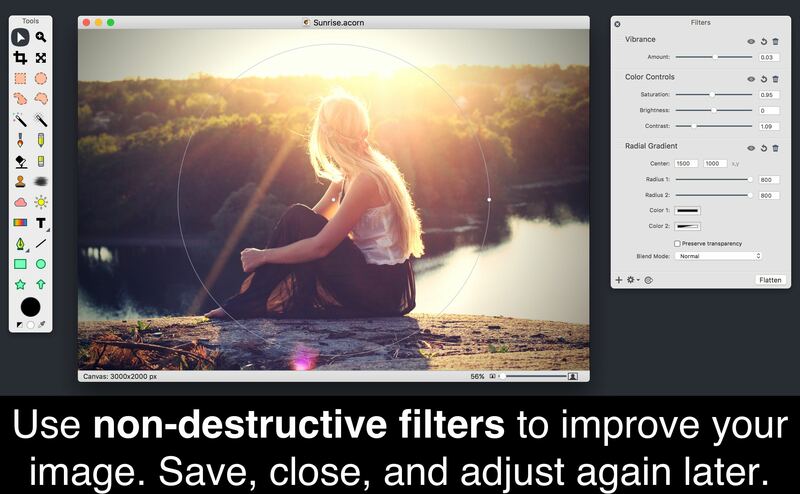 With Acorn’s filter panel, adding effects to your images has never been so easy. Effects can be seen in real time, so you can get your adjustments just right. Stars, arrows, Bézier curves, boolean operations, and text tools including circle text and path text are just a few of the vector features awaiting you. Modify stroke alignment, line join style, and shape blending all from within the inspector palette. Zoom, pan, and use shortcuts to change the scale of your image. Keep or remove image metadata, and find pixels that are out of range of sRGB. Preview your changes prior to exporting and compare to the original. Observe file size adjustments in real time! Acorn’s clone tool upgrades include the ability to clone across different images, layers, and to even clone from group or shape layers. Easily modify the brush softness and flow in the inspector palette. Hold down the shift key each time you click, and Acorn will treat the clone tool as a stamp tool. Smart Layer Export is similar to slicing. Check out the new configurable palette to setup a layer's Smart Layer Export settings. Adjust the movable frame that represents the export bounds of your image, name your file, and you can even choose to have your layer automatically export as @1x, @2x, @3x-@5x. sizes. 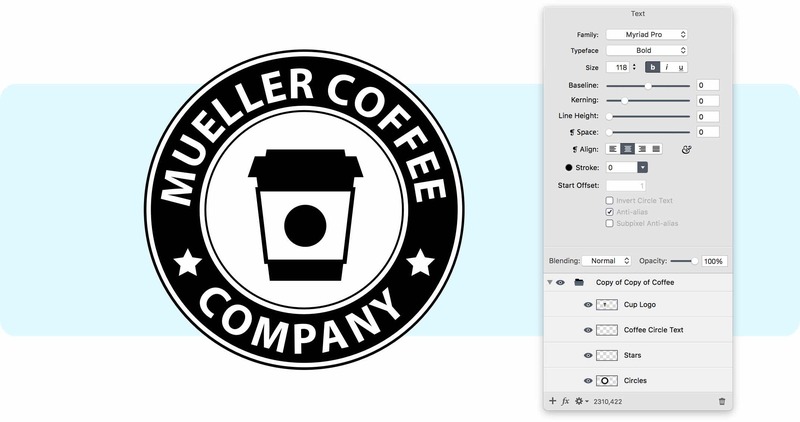 Use the clone tool across layers, images, and even clone group and shape layers. Make shapes from selections menu item. Draw a selection, convert it to a shape! New options for the instant alpha eraser tool make removing backgrounds even easier. Crop tool palette offers the ability to lock pixels and resize your image while cropping. Also check out the ‘Last Crop’ preset. Touch bar and meta-data improvements. New scale and transform options, so you can precisely resize your layers using on-canvas controls or manually enter values into the inspector palette. 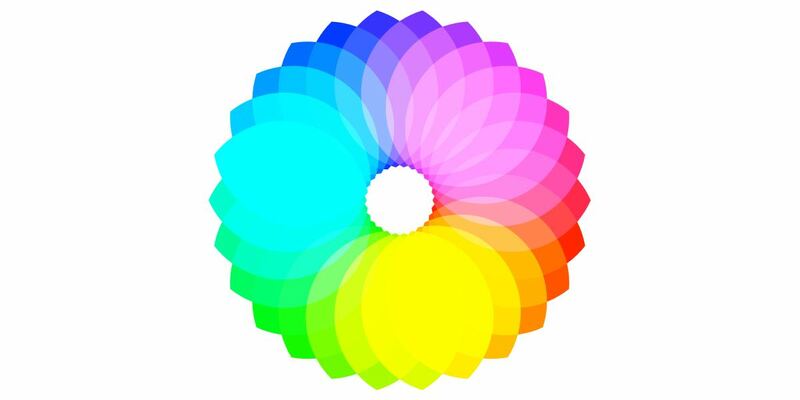 CMYK TIFF exports up to 128 bits per pixel. Flood fill tool now offers contiguous and non-contiguous options. A new 'Export All Layers' menu item. New Linear gradient blur filter and reflection filter. Use layer masks in your image to block out unwanted areas of your image or to expose layers below. Additionally Acorn’s Mask blend mode allows you to use your layer to clip layers underneath. Use a layer mask to easily lock layer transparency. Trim out parts of your image or layer and even rotate your image while you crop to make the perfect scene. Use the crop tool to quickly increase the size of your canvas. Lock the pixel dimensions to resize your image while cropping. Combine images together, then easily adjust the rotation, scale, and placement. Keep your layer’s width and height proportions intact or adjust independently. Use Acorn’s on-canvas controls to line everything up perfectly. The Clone, Paint, Smudge, Dodge, Burn, Stamp, and other tools that work on pixels have their own super configurable brushes with Acorn’s awesome brush designer. Adjust flow, softness, scatter, jitter, rotation…the options are endless. 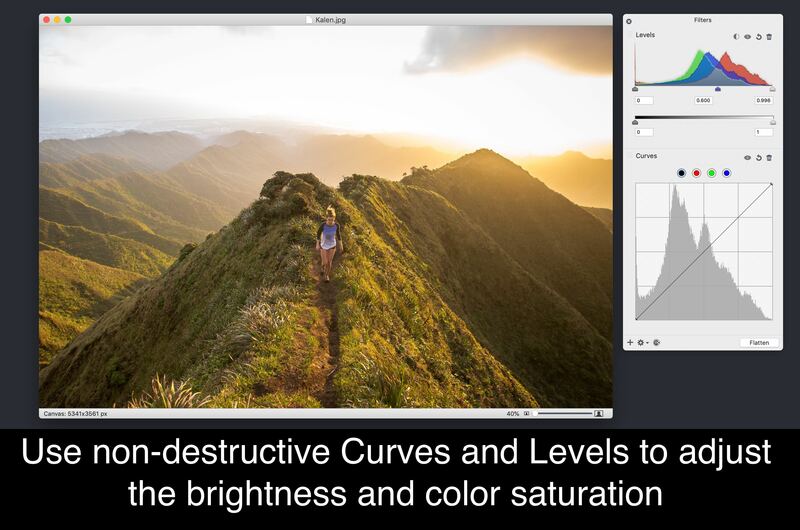 Adjust the tonal response and even the individual color channels to perfect the mid-tones, shadows, highlights, & contrast in your images nondestructively. Create presets to quickly make the adjustments you need. You have a nice camera, but you also need a nice app to import your high resolution images. Acorn is that app. And if your SLR supports more than 8 bits per component, Acorn has you covered as well. Import your images as 32, 64, or even 128 bit images. Acorn’s custom color picker includes a loupe that displays both RGBA and hexadecimal values. Quickly zoom in and out within the loupe to select an exact pixel color. Use Acorn’s snapping to line things up perfectly. Snap to grid, guides, selections, shapes, layers, and the canvas. Multiple alignment options are available for both bitmap layers and shapes. Automator can be used with Acorn to batch process images including watermarking, scaling, trimming, exporting, cropping, and more. Shape processors are filters for shape layers which allow you to move, tweak, generate, and adjust shapes. Best of all, the shape processors are non-destructible and stackable just like Acorn’s filters. 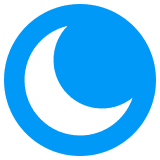 The .acorn file format is Acorn’s native file type, but Acorn can open and import JPEG, JPEG 2000, PNG, HEIF (with Mac OS 10.13 or later), GIF, BMP, TIFF, PSD, PDF, ICO, AI (with PDF compatibility), RAW, PICT, SVG, and TGA. And with PDFs you can set your resolution immediately upon opening. Acorn can import Photoshop brush files (.abr). Just drag and drop the Photoshop brush file onto Acorn’s icon in the dock to import and make new brushes. Union, intersect, difference, exclude, and divide. Perform boolean operations with multiple shapes to make complex vectors in your images. Stars, arrows, and a Bézier anchor selection tool await you. Modify the points of a star to create triangles, diamonds, and other variations! Rotate your text and shapes upside down & every which way. Use traditional photography techniques such as dodge and burn to highlight and darken your images. 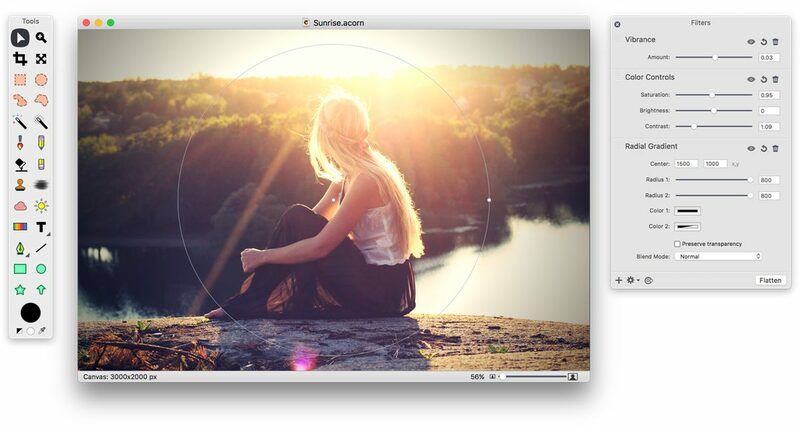 Acorn’s customizable clone, blur, and smudge brushes will have your photos looking great. Acorn has native support for Apple’s Retina displays. 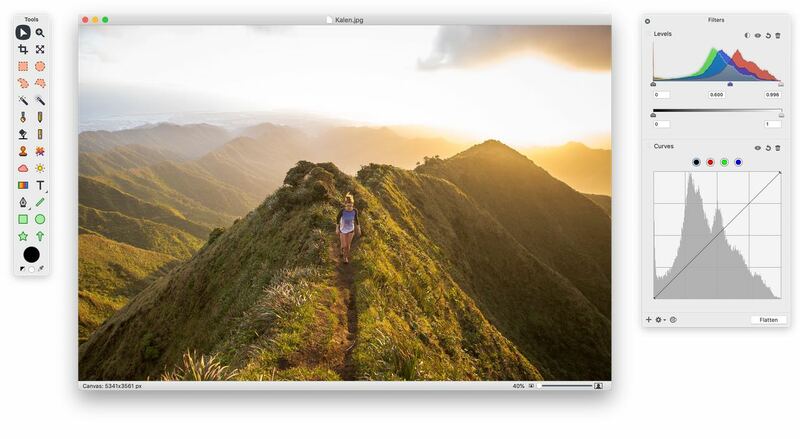 Your pictures will look absolutely stunning on your Retina MacBook Pro. Acorn gives you control over your text in an easy-to-use interface. Everything is in the text palette from bold and italic to kerning and ligatures. There’s even spell check. Watch your edits at 100% zoom in the New View window, while performing your edits at any zoom percentage. No need to switch back and forth in Acorn. Powerful eraser tools like Instant Alpha make removing photo backgrounds and other unwanted pixels from your images both fast and fun. Are two color gradients not enough for you? With Acorn’s multi-stop gradients, you have infinite rainbows at your fingertips. Save your gradients to use anytime. Use Acorn’s built-in brush designer to create new brushes or alter existing ones. Test your strokes out and watch them instantly update as you change the settings. Acorn can create layered screenshots of every window you have open on your computer. It’s magic. And if you have a camera on your computer, create a new image from your camera. Convert text to Bézier paths, add and subtract Bézier points, smooth, simplify, and reverse your paths. Have your edges snap to pixel boundaries for precise alignment. Optimize and export your images as PNG, JPEG, JPEG 2000, and GIF in Web Export. Choose from Acorn, BMP, GIF, JPEG, JPEG 2000, ICO, PDF, PNG, PSD, SVG, TGA, & TIFF in the Export panel. Option to select CMYK color profile when exporting JPEG or TIFF. Create custom selections, invert, feather, and even add a corner radius. Or, if you’re looking to quickly select an entire color, try using the magic wand. Switch into Quickmask mode to edit your selections seamlessly. Are there differences between the Direct and App Store versions of Acorn? Yes, there are some small differences. Make sure to check out our larger FAQ for all the gory details. Does Acorn open up layered Photoshop files? Yes! Acorn will open up layered 32bit PSD to the best of its ability. The only app that’s going to be 100% compatible with .psd files is the latest version of Adobe’s Photoshop of course. Does Acorn use a subscription? Nope! We have a simple philosophy- you buy a thing, you get a thing. I’m not running 10.11+, can I still use Acorn? Here’s the lowdown: Acorn 6 requires 10.11+. Acorn 5 requires 10.10+. Acorn 4 requires 10.8+. Both Acorn 2 and 3 require 10.6+. Acorn 1.5.5 runs on 10.4+. If you wish to purchase Acorn 1, 3, 4, or 5 go ahead and buy Acorn 6. Acorn 5.6.5 will accept Acorn 6 registration numbers. But if you need an Acorn 4, 3, 1 registration, email support@flyingmeat.com and let us know your registration name and number and we will make you a new one that works with an older version of Acorn. How do I grab and older version of Acorn? You can grab previous releases on our FAQ. Buy our wonderful photo editor. Lost a serial number, need to report a bug, or just want to ask a question? Chat with other users about Acorn.